One of the LMS 3-cylinder compound 4-4-0 locomotives, No. 1112. IT is said that, at the time of the “Races to Scotland”, in 1888 and 1895, when the East and West Coast companies were straining every nerve to beat each other, first to Edinburgh and Glasgow and then to Aberdeen, the Midland route to Scotland became unexpectedly popular. Nervous old ladies found a sudden preference for Midland travel because the longer overall times of the Midland inferred lower average speeds. “It is so much safer,” they said! They little knew that even then the maximum speeds of the Midland trains were very often as high as those achieved by their racing neighbours, the heavier gradients and longer distance covered by the Midland easily explaining the necessity. So it is to-day. The journey by the Midland route from London to Glasgow will take us an hour longer, roughly, than is needed by the West Coast Route from Euston to Glasgow. Yet the chances are that our 9.50 a.m. out of St. Pancras will do. in places, some far faster travelling than the more famous “Royal Scot”, which leaves Euston 10 minutes later and reaches the Scottish city 50 minutes in front of us. To start with, the 9.50 a.m. from St. Pancras - which, for the purpose of this article, I have christened the “Midland Scots-man”, though unfortunately it has no official title - has to travel 424½ miles against the 401½ miles of the “Royal Scot”. It has to make stops at Leicester, Chesterfield, Leeds, Hellifield, Carlisle, Dumfries, Kilmarnock and, generally, also at the suburb of Glasgow that enjoys the entertaining name of Strathbungo, before reaching St. Enoch terminus. On the other hand the “Royal Scot” has but two brief stops, one at Carnforth to change engines and the other at Symington to divide the train. Then, as previously mentioned, the Midland grades are, on the whole, the heavier of the two routes, notwithstanding the West Coast ascents to Shap and Beattock Summits; the Midland tops both with 1,167 ft altitude at Ais Gill, among the Westmorland fells. Again, both in England and in Scotland, the Midland route is hampered in places by the necessity for cautious running over certain lengths of line where colliery workings underneath have caused subsidences of the track; here is another reason for minutes added to the train schedules. Despite the extra time involved, however, the Midland route is still a favourite with many travellers. At the time when the railways were grouped together it was freely prophesied that Scotch expresses would cease to run from St. Pancras to Edinburgh and Glasgow. But all the intermediate towns and cities have to be considered, for these trains convey passengers from London to Leicester, Sheffield, Leeds and Bradford, as well as from the same towns to Carlisle and Scotland. To those to whom scenery is a more important consideration than time the Midland route will always appeal, because it is, without question, the most scenically attractive of all the three ways to Scotland. So it is still possible, fortunately, to go to St. Pancras and take a ticket for Glasgow, and somewhere about half-past nine in the morning we find ourselves, after a brief pause to admire the handsome Gothic exterior of the terminus - the most artistic station building in London - passing into the station and on to No. 4 platform. As terminal stations go, St. Pancras is small. It has only seven platforms in all, but most of the trains from the northern suburbs dive downward to join the Metropolitan line for Moorgate, so that St. Pancras has little more than main line trains to deal with. It is the one great roof span that is the chief internal feature of the station. Actually the trains are up in the roof, the main ties of which pass completely under the platforms. The major part of the building is a vast storage for the beer produced at Burton-on-Trent. It is said, indeed, that the unit of measurement to which the architects worked was the dimension of a standard beer-barrel, in order to obtain the maximum amount of storage space possible. Thus the trains live, as it were, up in the attic! The limited size of the station is typical of the train service. Light passenger trains and locomotives of moderate weight and power have always been the ruling principle on the Midland. No 4-4-2 or 4-6-0 engines have ever yet been built for Midland metals. Up till now, 4-4-0 designs have been regarded as sufficiently powerful, but in order to maintain the fast timings of the Midland it has been necessary strictly to limit their maximum loads. Until comparatively recently the figure was fixed at 240 tons for the compound 4-4-0 engines on the fastest, or “Special Limit” trains. They are now allowed to take rather more, but anything over 285 tare tons - ten eight-wheeled bogie vehicles - on our 9.50 a.m. down is likely to occasion the provision of a pilot engine. However, we shall find our train well within the one-engine limit. The increasing popularity of the old 9.30 a.m. down “Scotsman” led ultimately to its division. Now the Edinburgh portion leaves as a separate train at 9 a.m, serving Nottingham, Sheffield, Leeds and Skipton on the way to Carlisle; we stop, as previously mentioned, at Leicester, Chester-field, Leeds and Hellifield. Thus, as the Edinburgh train hands over to us at Carlisle a through coach that it had “collected” at Nottingham - the coach having come down from London by a train calling at Bedford, Kettering and elsewhere - practically the whole of the Midland system in this ingenious manner gets a through service to Scotland. We shall find our train marshalled, from the rear, in this order - six-wheeled brake, first-class brake, open first-class car, kitchen car, two open third-class cars in succession, third-class corridor coach and third-class brake with, next the engine, a composite corridor coach that has come through from Tilbury in connection with the new Continental steamer service from Dunkirk. Extra coaches are added to the formation at busy times, but this 9-coach load is the minimum figure that applies throughout the winter months. The total weight behind the engine tender may be taken as about 250 tons. Restaurant car fashions have undergone a considerable change on the LMS system during recent years. On all the chief trains it is now the practice to use an independent bogie kitchen car, containing kitchen and pantry, with accommodation for the restaurant car staff, but none for passengers. The latter travel in the beautiful open saloon cars that flank the kitchen on both sides. These are now quite a standard feature on the LMS, and are so popular that a second open third-class car is run in our train formation for passengers who prefer that kind of travel to confinement in a compartment. Our engine, of course, is a three-cylinder compound 4-4-0 of the Midland. In all the chequered history of locomotive compounding in this country, only the familiar Midland compound design can be held to have achieved real success. It originated with Mr. S. W. Johnson away back in 1902, and so is now a quarter of a century old. Subsequently Mr. R. M. Deeley introduced modifications of the design, and in particular of the regulator and valve-motion, and further improve-ments have been made by Sir Henry Fowler. To-day the Midland compounds share with the latest Great Western 4-6-0 types the distinction of being the most efficient express locomotives - on the true thermal efficiency basis, that is, of power developed in proportion to coal burned - that we have in the country. In recent years, therefore, this has been the most-multiplied of all LMS express passenger designs, the 45 engines that comprised the Midland “stud” at the time of the grouping having now expanded to something like 200 in all. These are at work on all parts of the system, in both England and Scotland. 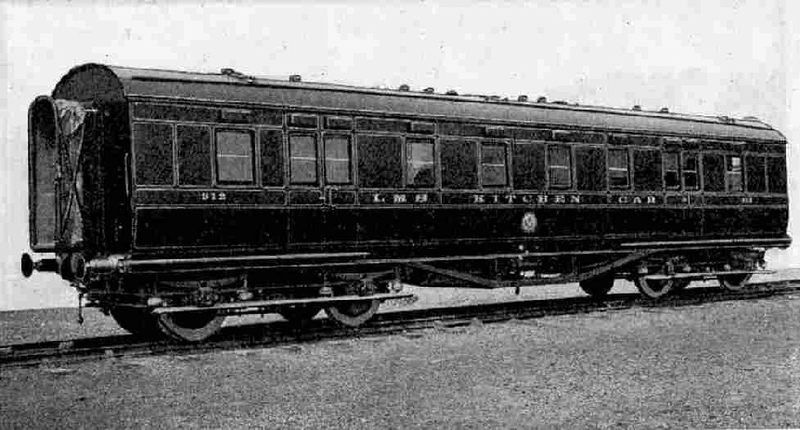 Exterior view of LMS Kitchen Car. This is not to say that the Midland compounds are the most powerful engines on the LMS system: far from it. When first they appeared on the Western division - the late L & NWR - the mistake was made of imagining that they could do the same work, in maximum conditions, that could be done, say, by the 4-4-0 “George the Fifths” of corresponding weight. They could not do this, however. 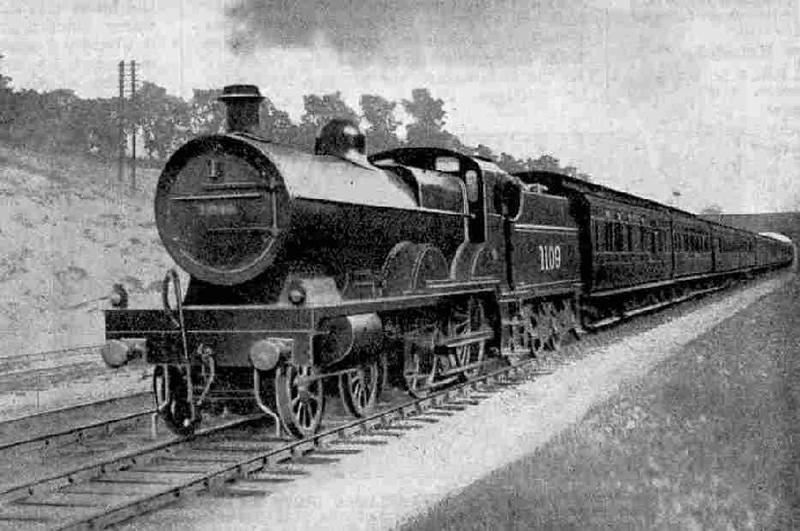 The double expansion of the steam has the effect of so lowering the “terminal” pressure -at which the exhaust leaves the blast-pipe - as to make it practically impossible to “thrash” the Midland compounds by driving them at long cut-offs and wide regulator openings and then burning coal at a very uneconomical rate to furnish the necessary amount of steam. Hut, within their limitations, the Midland compounds are extremely economical engines, and in these days of costly coal this is a consideration of no mean importance. They probably need more “brains” to drive properly than a simple 4-4-0, but drivers who have learned to handle them are loud in their praises - provided they are not over-loaded. The “tare”, or empty weight of our train to-day is 235 tons, and this is a nicely manageable load for our engine. There is a fairly steep incline out of St. Pancras, and for years past it has been the custom to allow the engine that has brought in the coaches to assist in the departure by giving a friendly “shove” out of the platform and for a few hundred yards beyond. Thus we get a good start, which is the more needed in that we have only 109 minutes in which to complete the first 99 miles, to Leicester. If you were on the footplate, you would be interested to notice that our driver only opens his regulator a very little way on starting. The secret of the Deeley regulator is that in this position, known as the “first port”, a small opening on the back of the regulator takes high-pressure steam direct to the two outside low-pressure cylinders, so that the engine starts as a two-cylinder simple. As soon as the train was well under way, we should see the driver bring the cut-off well back and then push the regulator right over, so changing to full compound working. The steam is now being carried to the centre, or high-pressure cylinder, and then, after a partial expansion there, on into the receiver, from which it passes to the two low-pressure cylinders for further expansive working. In common with all the Northern lines, the Midland has to climb out of the Thames Valley. The Midland climb is in three distinct stages. First of all there are 4½ miles up, largely through tunnels, steepening from 1 in 182 to 1 in 162, nearly to Cricklewood. From here we get a sharp drop of a couple of miles to the point where we cross the southern arm of the sheet of water known as the “Welsh Harp”. Just beyond Hendon, which we pass at a shade under 60 miles an hour, there begins a five-mile rise to Elstree, skirting for some distance on the left the Hendon Aerodrome and finishing through Elstree Tunnel. Then follows a second breather, of three miles down to Radlett, on which we may expect to reach between 65 and 70 an hour, as a preliminary to the five-mile climb past St, Alban’s, mostly, like the Elstree climb, at 1 in 176 or so. From the 21st to the 34th mile-post there are sharp undulations, during the course of which we dash through the big town of Luton, jointly famous for straw hats, Vauxhall motors and Skefco ball bearings. It is 30¼ miles to this point and we shall have taken, probably, about 36 minutes. Now there is a glorious “racing-ground” ahead. Shortly after passing Leagrave - which, singularly enough, marks the beginning of the River Lea and not the end of it! - we begin, at mile-post 34, a descent of 15 miles almost without a break, mostly at 1 in 200, and superbly fitted, by the absence of curves, for very high speeds. If the driver be so minded we shall touch 80 at Flitwick and again below Ampthill; in any case the speed is almost certain to reach or exceed 75 miles an hour. At 70 or so we dash across the Ouse, which marks the bottom of the descent and fly through Bedford by means of the avoiding line, which leaves the station on the right. All but 50 miles from London here, in about 54 minutes’ travelling time. The gradients now steepen. For six miles from Bedford there are undulations, in the course of which we get our first replenishment of the tender water supply, from Oakley track-troughs. Then comes the worst “bank” on the line - or during the first 200 miles of our journey at any rate - the ascent past Sharnbrook to mile-post 56¾ being for 3¾ miles at 1 in 119. The descent on the farther side, past Irchester to Wellingborough, is pretty nearly as bad. To ease the working of freight trains, when the goods lines were added, this “peak” was cut out completely by the adoption of a different location, well to the east of the main line. The goods lines can be seen on the right, dropping below the main line into Sharnbrook Tunnel, over a mile in length, whereas the main line is in the open air all the time. The effect of the ascent will be to reduce our speed to rather under 40 miles an hour, and in the subsequent descent the line winds rather too much to encourage high speeds by way of compensation. Another nasty climb begins at mile-post 70 and continues for eight miles past Kettering, which town, 72 miles from St. Pancras. will be passed in 77 minutes or slightly less. There are bits as steep as 1 in 118 and 1 in 132 in this climb, which leads to Desborough. Then follows a fall of 41 miles at 1 in 132 to Market Harborough, where again the momentum of the descent is lost by the necessity for slowing to 45 miles an hour over the sharp curve through the station. Yet another four-mile climb to Kibworth, a drop to Wigston, a slack over the Wigston junctions, and we roll under the roof of the fine Midland Station at Leicester at 11.39 a.m, on time. This run of 99 miles is the longest non-stop break that we shall make to-day. To the credit of the Midland Scotch services, too, it may be said that the 109-minute booking from London to Leicester, and the even faster 107-minute timing up involving average speeds of 54.5 and 55.5 m.p.h. respectively - are the fastest made by any Anglo-Scottish trains on all the three routes, with one Midland exception that we come to presently. Our engine probably will work through to Leeds - quite a strenuous four hours for the engine-crew, with a total mileage of 196 from St. Pancras. The Leicester-Leeds stage of the journey is not so interesting as there is little opportunity for speed, except along the beautifully level reaches of the Soar valley from Leicester to Trent, where we cross the famous river of that name. We shall attain from 65 to 68 miles an hour at Loughborough, taking a fresh water supply from Hathern troughs, and shall cover the 20¾ miles to Trent junction in between 22 and 23 minutes. The complicated junctions, with their sharp curves, are threaded at a funereal pace, after which we climb up the Erewash Valley at 45 miles an hour or so Special note should lie taken, just beyond Ilkeston Junction, of the fine all-steel lattice viaduct of the LNER, which spans the valley at a great height. To Chesterfield, the twisted spire of whose parish church is a singular and very prominent object on the left of the line, the 47 miles from Leicester require an hour; for the next 50 miles, to Leeds, we have 58 minutes allowed. By taking the direct line from Chesterfield down to Rotherham we miss Sheffield - and also, more important to the engine, the toilsome 1 in 100 ascent to Bradway Tunnel - and then ensues tolerably level travelling through a country of coal-mines, past Cudworth and Normanton, until we draw up in the Wellington Station at Leeds at 1.45 p.m. This is a terminal station, so our train is reversed. A fresh three-cylinder compound is now attached, and we leave behind us the engine that has brought us from London. Five minutes are allowed at Leeds for the big exchange of passengers and luggage that takes place at this important station. When we leave at 1.51 p.m, it is possible that we may be piloted, as the train is now faced with the 65-mile climb to Ais Gill. This begins modestly enough. Away through Shipley and Keighley to Skipton, although the tendency is rising, there are few severe grades; then follows a stretch of eight miles up, partly at 1 in 130, almost to Hellifield. For the 36 miles from Leeds to Hellifield we have 48 minutes allowed which, despite slacks over the Shipley and Skipton curves, is an easy schedule. Down Midland Scotch Express near Mill Hill. It should be noticed that compound No. 1046 has “borrowed” No. 1109’s tender! our driver has in front of him no less than 14½ miles continuously, not only up, but very steeply up - mostly, in fact, at 1 in 100 - until we pass into the shelter of Blea Moor Tunnel. That temporary shelter is particularly welcome at times when the wind is blowing like a hurricane across the fells, for the railway is in parts terribly exposed, and the tunnel is over a mile in length. On the upper part of the climb, and again after the tunnel, as we run round the head of Dent Dale at a great altitude, the views are simply magnificent - Nature at her wildest. The Yorkshire summits of Whernside, Ingleborough and Penyghent are prominent features in the landscape. From Blea Moor to Ais Gill is an elevated table-land, the summit signal-box at Ais Gill, being 1,167 ft above the sea. Incidentally we take water, at Hawes Junction, from the highest track-troughs in the world. In covering the 28½ miles from Hellifield to Ais Gill we shall do well if we take no more than 41 minutes, maintaining 35 miles an hour or so up the 1 in 100 climb to Blea Moor. Now we have a swift run down to the Westmorland county town of Appleby, not more than 17 minutes being needed for the 17½-mile spin from the summit. A stop of one minute suffices here, after which the gradients are again mostly falling to Carlisle, the booked time for the 30¾ miles being only 33 minutes, start-to-stop, including the slow approach to Carlisle, and affording the fastest start-to-stop run of the journey. We may attain 80 m.p.h. in keeping this 55 m.p.h. schedule, but speeds from Ais Gill down to Carlisle are not generally allowed to exceed 75 or so, owing to curves. There is more wonderful scenery on the way down from Appleby to Carlisle, first of all on the left, where Helvellyn, Skiddaw and other Lake District mountains come into view, and then on the right, where we overlook the sinuous course of the River Eden, flowing between sandstone cliffs far below. On reaching the Border city of Carlisle - most outstanding of all railway centres, with the possible exception of York, in the opportunities of locomotive observation that it offers to the railway enthusiast - at 4.15 p.m, we have travelled 309 miles from London. The “Royal Scot”, with 10 miles less to go, sailed through half-an-hour previously. Off comes our compound, and on comes yet a third, for the remainder of the journey to Glasgow. Three engines thus divide up between them the 424½-mile journey, in the proportions of 196, 113 and 115½ miles respectively. With the fresh engine comes on the coach that left London at 7.45 a.m, more than two hours before us, travelling down by way of Nottingham and Sheffield. Possibly another third-class corridor coach may be added as well, in which case the gross load will be now round about 310 tons. Little space remains in which to describe the rest of the journey, but it is of unfailing interest. For the 33 miles of undulating grades to Dumfries we are allowed 44 minutes, but within the compass of this time may be required to stop and set down passengers at the mid-way station of Annan. We run out of Carlisle over the old Caledonian main line to Gretna and then diverge to the left, skirting the Solway Firth on the left, with the mass of Skiddaw across the water opposite and Criffel a prominent object in front of us. Just before Gretna track-troughs have recently been laid - the first to make their appear-ance in Scotland. After Dumfries comes some stiff climbing, although the old Glasgow and South Western main line falls far short in maximum altitude of the neighbouring Caledonian 1,015 ft at Beattock. Still, there is not much intermission in ascending between the 29½ and the 57th mile out of Carlisle - 27½ miles in all - with many miles up at 1 in 200 and then at 1 in 150, past Thornhill and Carronbridge. There is a welcome downhill break of 4½ miles from Carronbridge Tunnel, where the line winds through a deep wooded gorge, amid magnificent scenery. On the level stretch of the bleak uplands of Ayrshire, near New Cumnock, further water-troughs have been laid - the last, over which we shall pass. Then we have 17 miles of falling grades, nearly to Kilmarnock, down which speed is usually strictly moderated owing to curves and speed reductions through colliery areas. The descent does not become steep, however, till we have threaded Mossgiel Tunnel, beyond Mauchline, after which there are 4½miles down at 1 in 100. From Dumfries to Kilmarnock, 58½ miles, we are allowed 72 minutes. Much the steepest grades of the journey occur in the final 24 miles between Kilmarnock and Glasgow, where we may need pilot assistance. The climb from Kilmarnock to Dunlop includes 1½ miles at 1 in 87 and two miles at 1 in 75; and from the other side of the flat “table-land” past Lugton and Caldwell we descend even more steeply, with 3½ miles continuously at 1 in 67 to 1 in 70. We are now in the southern outskirts of Glasgow, and after making the conditional - but customary - halt at Strathbungo, we roll slowly over the Clyde round the wide curve into St. Enoch terminus punctually at 7.6 p.m. Since these lines were written, announcement has been made that the 9.50 a.m. express from St. Pancras to Glasgow is to run on an accelerated timing throughout the winter, the arrival time at St Enoch’s Station in Glasgow being at 7 p.m, instead of at 7.6 p.m. Details of the speeding-up are not at the moment available, but it is probable that the 6 minutes’ gain will be lopped off the easy schedules north of the Border for there is very little time to spare, as we have seen, between London and Carlisle. New names, too, are to be bestowed on certain of the expresses on this service. The 11.45 a.m. from St. Pancras to Glasgow, over the same route, is to be known as the “Thames-Clyde Express”, and the 9.0 a.m. from St. Pancras to Edinburgh, which has preceded us to Carlisle, as the “Thames-Forth Express”. You can read more on “The Evolution of Compounds”, “The Royal Scot Route” and “The West Coast Postal” on this website.